The foundation is that part of the structure that transfers the loads to the supporting soil in such a way that the resulting bearing pressures are kept under acceptable limits. If the underlying soil is satisfactory, then a spread footing is usually the recommended solution by the soils engineer. In addition to the stability checks and the design for flexure, a spread footing needs to be designed for shear. 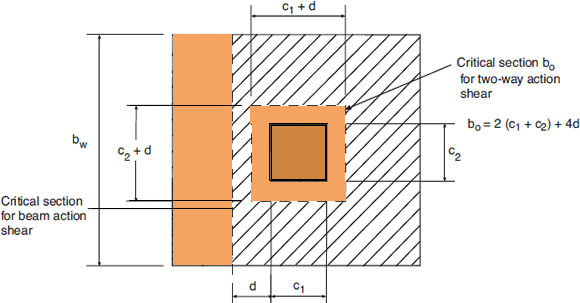 This blog post discusses the shear checks required by ACI 318. Our software ASDIP FOUNDATION will be used to support our discussion. What are the shear checks required by the ACI 318? One check recognizes that the footing may fail in shear as a wide beam along a critical section at a distance d from the column face in each direction. This is called “beam shear” or “one-way shear” as it resembles the shear check in a concrete beam. The second check considers that the column may penetrate, or punch, the footing. This is called “punching shear” or “two-way shear” and occurs not along a straight plane, but along a 3D plane at a distance d/2 all around the column, being “d” the effective depth of the rebars from the extreme compression fiber. The two checks include the calculation of the concrete shear strength, the calculation of the shear acting at the critical plane described above, and then the comparison of both. Usually the shear strength is provided by the concrete only, otherwise a special and expensive shear reinforcement would be necessary. The footing thickness could be affected by the controlling check. 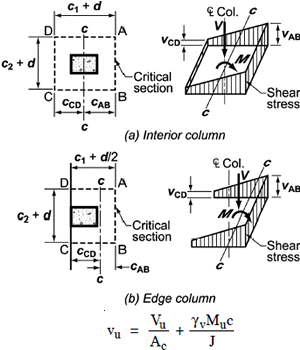 The figure below shows schematically the critical sections for shear. How do you calculate the one-way shear? The first step is to calculate the bearing pressures under the action of the factored loads. The one-way shear is then the volume of the bearing pressure under the colored strip in the figure above. If the pressures are uniform this calculation is quite simple. Consider now the case of a biaxial footing in partial bearing. In this case the shape of the volume of the resulting pressures is irregular and much harder to calculate. ASDIP FOUNDATION uses an algorithm based on triple integrals of the type V = ∫∫∫dV to find the volume of these solids, and therefore the shear forces in the footing. The pictures below show the factored shear forces of a typical footing under biaxial bending as a result of partial bearing. Note the lighter hatch representing the effective shear areas in both directions, and the values of the bearing pressures at the corners. What are the factors affecting the punching shear? Punching shear is produced directly by the forces and moments acting on the column. For the simple case of a concentric footing with a downward load, the punching shear can easily be calculated as the volume of the bearing pressures on the critical area around the column. However, in the presence of overturning moments the calculation may become very cumbersome since the shear is no longer uniform along the critical section. This is similar to the case of an elevated flat plate supported by a column, where the unbalanced moments will produce a shear at the slab-column junction. The factored shear stress on the critical section is the sum of the direct shear and the shear caused by moment transfer, as shown in the figure below. In this expression γv is the fraction of the moment being transferred by shear and J is the polar moment of inertia of the critical section. A third term may be added for the moment in the other direction. Since both Vu and Mu are involved, it’s better to compare the punching shear to the shear strength in terms of stress, rather than force or moment. How do you calculate the footing shear strength? The concrete shear strength in one-way action is defined by the expression φVc = φ2√f’c bd, where b is the footing dimension under consideration. On the other hand, the punching shear strength depends of the column location on the footing, either interior, edge or corner, per the expression φVc = φ Min(2+4/β, αs d/bo+2, 4) √f’c, where β is the column aspect ratio and αs is the column location factor. ASDIP FOUNDATION calculates the one-way shear and the punching shear as described above and compares them to the corresponding calculated shear strengths. 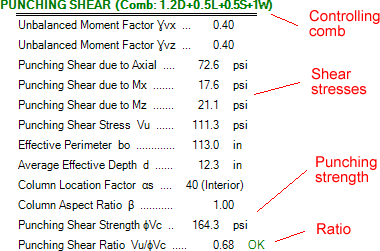 The figure below shows the typical punching shear calculations reported by the program for the controlling load combination. Footing design includes two shear checks per ACI 318: One-way shear, and Punching shear. The shear strength is usually provided by concrete alone in order to avoid expensive shear reinforcement, therefore shear could control the footing thickness. For an overview of the footing design process, please refer to my blog post Spread Footings Under Biaxial Bending – A Complex Design Subject. Detailed information is available about this structural engineering software by visiting ASDIP FOUNDATION. You are invited to download a Free 15-Day Software Trial or go ahead and Place Your Order.